Midfielder Fernando Gago has agreed to terms with Real Madrid. Boca Juniors president Mauricio Macri wants Gago to remain until June in order to play in the upcoming Copa Libertadores. Real Madrid president Ramon Calderon would like to unveil Gago as early as Sunday. Carlos Tevez, Argentina international, accepted only half of his punishment for walking out after being subbed-off in Sunday's 1 - 0 win over Sheffield United. The 22-year-old's West Ham teammates voted on a two-part punishment requiring Tevez to make a donation to charity and then to wear a Brazil national team jersey. Of the second requirement, Tevez expressed his respect for Brazil but also laughed and stated, "I can get all my salary discounted but I am never going to dress in Brazil's or River's shirts." Rumours have Chelsea's Andriy Shevchenko being loaned to AC Milan in January's transfer window. The Shevchenko rumours are linked with speculation of a Chelsea swoop for Valencia's David Villa. Valencia president Juan Soler's only reply has allegedly been in reference to Villa's £100 million buy-out clause. Bayern Munich chairman Karl-Heinz Rummenigge has threatened to pull out of the G-14, the club of Europe's biggest clubs. Earlier in the week, Rummenigge had complained about Chelsea's spending power and Real Madrid's lack of interest in the well-being of other clubs. Pictured here is the "Gaucho", which is approximately £65. 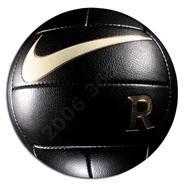 The Nike Tiempo Magician, another ball in the 10R line, is approximately £20. 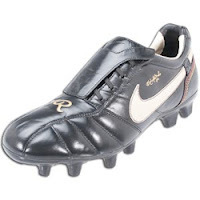 The Ronaldinho Tiempo 10R Shoes can be found here. Click Here for the "Magician" - approximately $30. 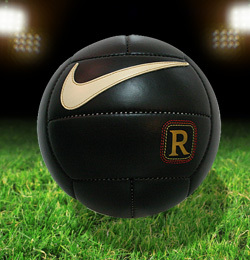 The Nike Tiempo Gaucho, another ball in the 10R line, is approximately $130. Carlos Tevez did not stick around after he was subbed-off in the 66th minute of West Ham's 1 - 0 win over Sheffield United. The Argentine striker received a good reception when he was replaced by Teddy Sheringham, but Tevez apparently was frustrated at being taken off. Much speculation has surrounded Tevez and teammate Javier Mascherano since Eggert Magnusson took over the club this week. Chelsea's Peter Kenyon has claimed his side are looking to pass Manchester United's "biggest club in the world" status by 2014. Sir Alex Ferguson has fired back, as the war of words in the run-up to Sunday's showdown at Old Trafford heats up. United are top of the table, three points clear of the EPL Champions. The ban on traveling fans in Argentina is being lifted by the AFA. The ban, which was being enforced in an effort to stop fan violence, had caused a rift between fans, management, and the players. A number of matches in this year's Apertura have been suspended due to unruly crowds. Both were already through, now Lyon are Group E winners. Van Nistelrooy scores late, but then misses a penalty that would have surely sealed the win. Bucuresti finish 3rd and are on to the UEFA Cup. In the 81st, Shunsuke Nakamura curls a spectacular 30-yard free kick into the top corner as Celtic make their first-ever trip to the last 16 of the Champions League. Louis Saha has an equally spectacular miss when he has only keeper Boruc to beat and pulls up, thinking that play was ruled offside. Saha goes on to miss a last-minute penalty as United will now need to avoid defeat to Benfica on the Group Stages' last day. Benfica will need to beat Manchester United on the last day to go through. The Gunners now top the Group with 10, even with Porto who they play on the final day. A draw will get them through. Moscow are just 2 points back. Porto are even with Arsenal on top and only need a draw to get through. Moscow are still alive, but will need a win and a winner from Arsenal v Porto. Milan are already through. Athens control their own destiny in second, one up on Lille. A win against Anderlecht on the last day would see them through without help. Lille sit third on 6 points. The French-side will need help from Anderlecht to overcome second-place Athens. The English champions are through despite the loss. Bremen will need to draw or win at the Nou Camp to go through. The holders will need to defeat Bremen to progress. After a rough start in the Group, Inter are through to the Knockout Stage. Bayern were already through, but will now need a result against Inter to win the Group. Both teams were through, but the Reds now win the Group. Bordeaux go to the UEFA Cup. Shakhtar Donetsk could go through, but they will need help from Valencia who play Roma. The Italian side control their own destiny, but a slip-up would mean they would need help from Olympiacos. Valencia are through as Group winners as Olympiacos can still make the UEFA Cup. Fabio Cannavaro has been named European Footballer of the Year according to Real Madrid president Ramon Calderon. Featured Weekend Matches in the English Premier League, La Liga, Serie A, and Argentina Apertura. Geremi scores with a lovely free kick into the top corner. Essien hits the post as West Ham hardly threaten. Carlos Tevez is for all intents and purposes a midfielder, but still plays well, providing numerous opportunities that his teammates fail to take advantage of. Chelsea keep pace with United for next week's showdown. A Wayne Rooney double erases an early Keith Gillespie goal. Evra's cross on Man U's second was superb, but paled in comparison to Rooney's spectacular volley. Fergie's side are up three on Chelsea going into the big match on Sunday. Fabregas hits the bar for the Gunners, but it is Newcastle who strike first through Kieron Dyer. Arsenal have 26 shots to the Magpies 2 and super-sub (46') Henry finally puts things right when he knocks a free kick off the crossbar and in to salvage a point in the 70th. Woodgate clears a Crouch header off the line to deny the Reds. Rafael Benitez' side can officially start thinking about that fourth Champions League spot. Madrid score through a powerful Sergio Ramos header in the 5th, a patented left-footed Jose Antonio Reyes strike in the 58th, and a Mahamadou Diarra tap-in in the 71st. A comedic goal celebration sees Ruud Van Nistelrooy tugging at Diarra's head before slamming him to the ground and falling hard on top of the Malian midfielder. Garay answers back for Racing in the 76th and Iker Casillas is called on time and again to preserve the win. Madrid are on 23, two behind leaders Sevilla. Barca is also on 23 and plays Sunday. Escude scores the first on a low drive off an indirect free kick. Luis Fabiano makes it two on a lovely through ball from Daniel Alves. Fredi Kanoute finishes the rout with a cheeky tap-in after controlling nicely in the area. Sevilla are in first on 25 with Barca playing on Sunday. AC Milan continue to collapse after a bright start to the season. 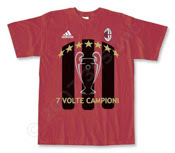 Hitting the post on numerous occasions, the best the Rossoneri can do is salvage a point and avoid another defeat. Empoli hang in 4th, as Milan are 19 points off the pace and might do well to grab a Champions League spot. At the end of the first half, Palermo's Simplicio is sent off for bringing down David Suazo as he races alone towards goal. The visitors give up all the points when on-loan from Palermo striker Simone Pepe poaches a 90th minute winner. Palermo are even at the top on 27, with co-leaders Inter playing on Sunday. Calderon and Platti score in 89th and 93rd respectively to keep the Apertura alive. Oscar Cardozo had earned and scored a penalty in the 31st that almost stood up. Estudiantes are now only 1 point behind Boca, who play on Sunday. On a negative note, the away-fans-ban left the stadium completely empty on one end, removing the boisterous celebrations that would have surely accompanied the two late goals. Gudjohnsen gets two to keep Barca atop La Liga one ahead of Sevilla and three above Real Madrid. Iniesta and Ezquerro add one each to make the rout complete. Hernan Crespo's 4th minute goal stands up as Inter go three up on Palermo. Two for Panucci. Two for Perrotta. One for Mancini, Montella, and Totti. Roma still just four points back of Inter. Gallardo and Higuain keep River's slim hopes alive. Cardozo and Diaz both score brilliant goals as Boca stay four up on Estudiantes and seven up on River with only three to play. Chelsea superstar Didier Drogba scores three goals in the Blues 4 - 0 rout of Watford.